Retail $4.13 SAVE 45% ! For clamping delicate work where proper tension is a must. Clamps incorporate side beams marked in inches. Notched jaws to help keep projects steady. these will get a lot of use. will be nice when building structure&apos;s and need to hold wall&apos;s together. 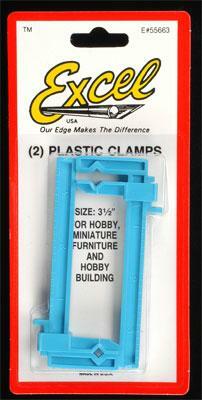 a 1-2-3 block and these clamp&apos;s will do the trick. "Works Great and Made in USA"
These clamps allow you to use the right amount of pressure without putting too much stress on the plastic. They are made in the USA which is a plus. I have found myself using these clamps a lot. "Wish I had found these sooner!" I bought a 1/16 Corvette kit and the only flaw in the kit was that the crossbar was broken. I never would have gotten it glued together properly without these clamps. The crossbar is delicate and thanks to where the break occurred it couldn&apos;t hold much weight. The clamps are the perfect size and light enough to hold the crossbar without putting undue stress on the part being glued. They held tight without slipping. I removed the clamp a few hours late and the piece was solidly glued in place and had not slipped.